In this week’s My Model Monday, I compare our 2018 NHL Season Simulation results to the current NHL futures odds to see where our model is differing from betting markets. For example, the Tampa Bay Lightning are currently the favorites to win the Stanley Cup at +600 (or 6-1) and let’s say we bet 1 dollar on them. We can convert that to a probability by taking: (or 14%). Remember, if you win your bet, you get back the money that you risked (in this case, 1 dollar) which gets added to the denominator. Keep in mind that the betting market implied probabilities will be slightly higher than our probabilities since the sportsbooks are adding in a charge for you to make a bet (aka the “vig” or “juice”). For example, if you sum our probability to win the Stanley Cup across all teams, it equals 100%, whereas the same calculation for betting markets sums to 137%. Vegas is the only team running away with their division right now, and our simulation agrees with betting markets on their 75% chance of winning the Pacific. Our model is much higher than betting markets on Nashville (-115 in current betting markets), Boston (+250), and Philadelphia (+500) to win their divisions. Conversely, our model is not as confident as the betting markets on Tampa Bay (-300), Toronto (+450), New Jersey (+500), Columbus (+600), San Jose (+750), Calgary (+800), or Los Angeles (+900) winning their divisions. Although Tampa Bay currently leads the Atlantic, our model actually makes Boston the favorite to be on top when the dust settles. The differences between our probabilities and the betting markets on making/winning the Stanley Cup are much slimmer than the division odds. The only teams that our probabilities favor more than betting markets are Washington (+800) and Minnesota (+1400). On the negative side, our probabilities do not see any value in bets on Vegas (+300), Pittsburgh (+300), Boston (+400), New Jersey (+1200), or Anaheim (+1400). 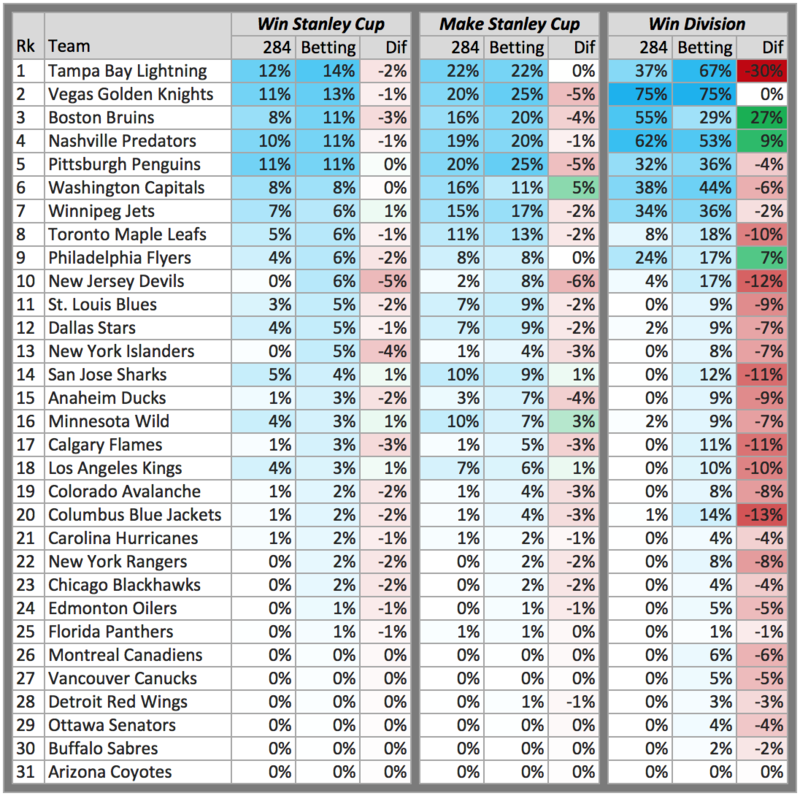 Unfortunately, there is not a standout team to love here, but our probabilities are roughly in consensus with betting markets on Tampa Bay (+600), Vegas (+700), Nashville (+800), and Pittsburgh (+800) as having the best chance to win the Cup this year. Lastly, according to our simulation, you are better off lighting your money on fire than betting on New Jersey (+1600) or the NY Islanders (+2000) to win the cup. Note: our simulation results are as of February 24, 2018, and will change as the NHL season progresses, as will the betting market odds.